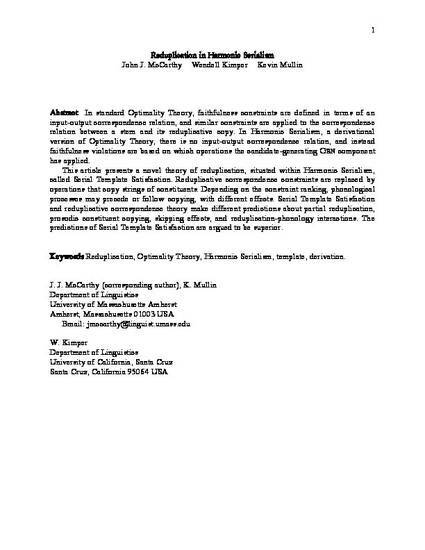 In standard Optimality Theory, faithfulness constraints are defined in terms of an input-output correspondence relation, and similar constraints are applied to the correspondence relation between a stem and its reduplicative copy. In Harmonic Serialism, a derivational version of Optimality Theory, there is no input-output correspondence relation, and instead faithfulness violations are based on which operations the candidate-generating GEN component has applied. This article presents a novel theory of reduplication, situated within Harmonic Serialism, called Serial Template Satisfaction. Reduplicative correspondence constraints are replaced by operations that copy strings of constituents. Depending on the constraint ranking, phonological processes may precede or follow copying, with different effects. Serial Template Satisfaction and reduplicative correspondence theory make different predictions about partial reduplication, prosodic constituent copying, skipping effects, and reduplication-phonology interactions.